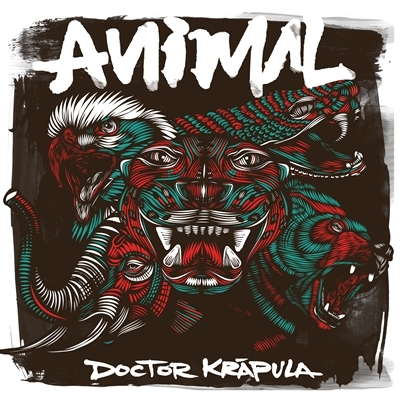 The jaguar roars again, Doctor Krapula releases "ANIMAL", their new studio album. The controversial and popular band Doctor Krapula releases their eighth studio album, an album recorded in live sessions in Bogota City, that contains 10 powerful songs with the sound and personality that characterizes this Colombian band. Keeping its position in front of political and social issues, the band also reflects this time upon love and party nights, but above all makes a special emphasis on the search for an increasingly authentic sound. "It's a very organic album, we played each song 3 times in the studio and we chose the more hearty shots." Doctor Krapula has accustomed its followers to a powerful rebel party that from the first chord breaks the routine and takes the masses to ecstasy with its solid rhythm and sharp messages, and the new album ANIMAL promises to potentiate this energy on stage. Songs like "Democracy" or "Pendejos", which have already been censored in Latin America as well as a traditional punk dance "Hey Ya Aho" make art of this memorable album that you can not stop listen to ! The band will be visiting the European territory during the summer .